As a new retiree, you may be wondering how to manage your retirement income. Last month, president of Charles Schwab, Carrie Schwab-Pomerantz, published an article titled “Newly Retired? Fresh Ideas for Managing Your Retirement Income”. This article hits key points of 1) Which accounts and investments you could draw from first, 2) Options for rebalancing your portfolio once you start to withdraw, and 3) Considering taking your required minimum distributions to avoid penalties (if 70 ½ or older). Click here to read the entire article, or continue reading for a summary below. At the point of retirement, you may want give very careful thought to your asset allocation. Mainly, you may not want to take on as much risk in your investments as you did when you were younger and still working. Aside from your Social Security, a pension, real estate investments, or other sources of income, you may want to figure out how much money you could need to withdraw from your retirement accounts. Your most tax-efficient investments may need to be kept in taxable accounts, and your least tax-efficient investments may need to be be kept in tax-deferred accounts. Maintaining well-diversified portfolios of many types of investments including stocks and bonds could possibly help protect against inflation over your many years of retirement. Draw Down Principal from Maturing Bonds and CDs: The first strategy you could use would be to create a short-term ladder of bonds or CDs, and then you could tap the principal of each bond as it matures. Take Your RMDs if You’re 70 ½ or Older: Once you reach 70 ½, the IRS requires you to take a yearly distribution from many retirement accounts, known as a Required Minimum Distribution (RMD). Sell Overweighted and Lower-Rated Investments from Your Taxable Accounts: Since withdrawals from taxable accounts are taxed as capital gains rather than ordinary income, these could be the next accounts from which to draw retirement funds. Sell Overweighted and Lower-Rated Investments from Your Tax-Deferred Accounts: Generally, your tax-deferred accounts could be the last place to look for retirement income. Please note: This post is for informational purposes only and is not intended as advice. Since everyone's situation is different, please consult a professional before changing your portfolio. 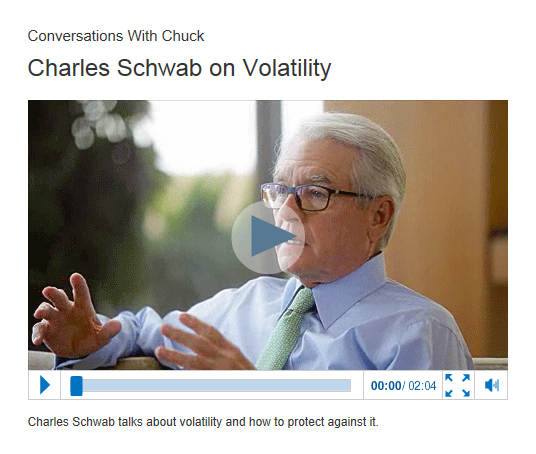 Check out this video interview with Charles Schwab on market volatility and portfolio diversification. Continuing from last week’s post, this week we will finish our discussion on “Creative Strategies to Collect More Social Security Income”. Before jumping into Part 2 of 2, we recommend revisiting last week’s post for an overview of the terms FRA and PIA. 3) Harness the power of the little-known Spousal Income Benefit: Once one spouse is eligible to receive SS benefits, the other spouse may be eligible to get up to 50% of those benefits as well, until claiming his or her own SS benefits. This option is also available to divorcees as well. The Spousal Income Benefit is available to the second partner regardless of whether the first partner is actually collecting benefits or has decided to file and suspend. The Spousal Income Benefit will be available to the second partner once he or she reaches the age of 62, but will be available at a reduced/pro-rated amount until he or she reaches FRA. At FRA, the second partner can receive 50% of the first partner’s PIA. It is important to note, once the second partner starts collecting the Spousal Benefit Income, the amount he or she claims is the amount of Spousal Benefit that will be received for the rest of his or her lifetime, until claiming his or her own SS benefits. Once claiming his or her own SS benefits, the second partner will receive the higher benefit of the two. 4) Plan for the Surviving Partner’s Income Benefit: Widows or widowers may be entitled to receive a portion of their deceased partner’s SS benefits, which may be increased by using the previous strategies. Click here to see how much surviving family members would receive. As a side note, the Social Security Administration should be notified as soon as possible when any family member passes away, because there are several other ways that Social Security can help you when a family member dies. 5) Compute your optimal benefit amount: Rather than picking one or two strategies to increase your SS benefits, finding the right combination of all the strategies discussed for your situation can be advantageous in figuring out how to collect more SS income. Since Social Security rules are very intricate and every situation for every family is different, meeting with a Social Security specialist would be your best way to use this strategy. This post is for information purposes only. It is not intended for use in determining when or how to claim Social Security benefits, as benefits and strategies vary based on individual circumstances. Our firm is not affiliated with the Social Security Administration. For more information or for help determining a specific strategy for your own situation, please contact our office at (816) 233-4100, or contact the Social Security Administration directly by visiting www.ssa.gov. As mentioned in last week's post, this week we would like to start discussing “Creative Strategies to Collect More Social Security Income”. Lucky for us, one of our Family Investment Center advisors, Mrs. Elaine Coder, is our designated Social Security Specialist. I recently worked on an educational presentation with Elaine, and through that experience I gained a lot of insight into how just about anyone, in just about any situation, can use these strategies to incorporate Social Security as a key factor in their retirement plan. Full Retirement Age (FRA): The age at which a person may first become entitled to full or unreduced SS benefits. Click here to find your FRA. Primary Insurance Amount (PIA): The benefit amount a person would receive if he/she elects to begin receiving SS benefits at his/her normal retirement age. At this age, the SS benefit is neither reduced for early retirement, nor increased for delayed retirement. Once claimed, this PIA is what you will receive for your lifetime. Life Expectancy (LE): The average period of time that a person can expect to live. Click here to calculate your estimated LE. 1) Wait as long as possible to claim SS benefits: There are many advantages to waiting to claim SS benefits. First, by the taking time to research and meet with a Social Security Specialist, you ensure that you have covered all strategies and that you will be applying for the maximum PIA when it is time to claim. Second and third, by waiting to claim until you are past your FRA, your PIA will not be penalized for claiming early, and you will earn delayed retirement credits, which increases your PIA. Finally, since your PIA is adjusted based for inflation, each year you wait to claim can increase your PIA even more. 2) Claim SS benefits correctly the first time: Once you apply for your SS benefits, you only have 12 months to withdraw your application, and you are limited to one withdrawal per lifetime. There are several other “hoops” to jump through if you withdraw, including paying back the benefits you and your spouse/children received, as well as having anyone who received any of the benefits consent in writing to the withdrawal. Also, if you miss the 12-month window to withdraw or adjust your claim, you can no longer make any changes and the PIA you claim is the PIA you will receive for the rest of your life. So, if after applying and claiming your SS benefits, you find out that you missed a step or didn’t capitalize on a claiming strategy, there is nothing else to be done. Claiming correctly the very first time avoids all of these concerns. Next week we will discuss strategies including the living spousal and survivor benefit incomes, as well as how you can combine strategies to be able to compute your overall optimal benefit. Make sure to stay tuned!